Colin Smyth of Clare in action against Dean Broaders of Kilkenny during their Oscar Traynor semi-final at Frank Healy Park, Doora. Photograph by John Kelly. 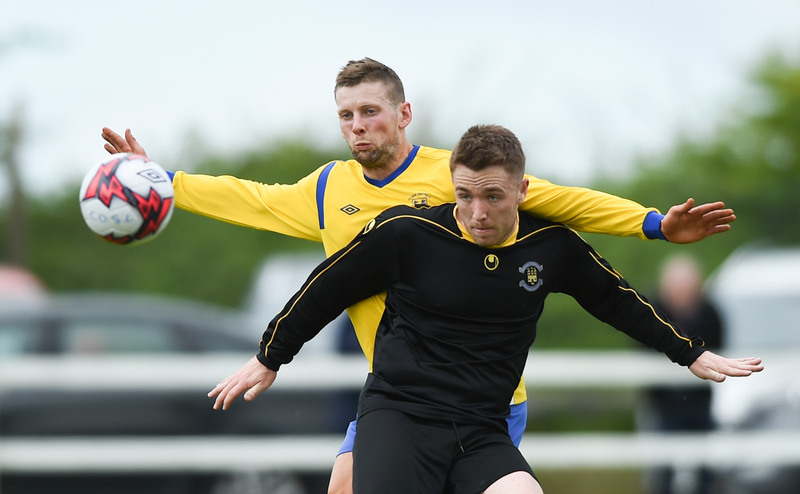 Clare’s dream of a third successive Oscar Traynor title die at Frank Healy park in Doora this afternoon when a lively Kilkenny side emerged as deserving winners. With extra time looking likely, Kilkenny struck for what proved to be the winning goal when Emmett Nugent outpaced the Clare defence before cracking home the winner to the roof of Barry Ryan’s net. The Kilkenny player picked up a yellow card when he removed his jersey as he celebrated what proved to be the winning score. While the visitors enjoyed the major share of possession in the opening half, it was Clare who came closest to scoring. Just after the half hour mark Dave McCarthy’s effort rebounded off the crossbar with the Kilkenny defence beaten while earlier Gary O’Connell had his effort saved by the Kilkenny goalie Owen Wall. Five minutes into the second half Derek Fahy saw his effort rebound off the post after he latched onto a delivery from Eoin Hayes. The deadlock was broken twenty five minutes into the half when Kilkenny’s Dean Broaders was adjudged to have been fouled in the area and team captain Niall Andrews converted from the spot despite the best efforts of Barry Ryan who got his hand to the ball but was unable to keep it from entering the net. On the half hour mark Clare introduced Colin Scanlan and two minutes later he was hauled down in the area which led to a penalty. Eoin Hayes sent the visitong goalie Owen Wall the wrong way ad he drilled home the equaliser. The pace of Kilkenny had troubled Clare throughout and Emmett Nugent outpaced the Clare defence before firing home what proved to be the winner three minutes from the end. In the remaining time Clare were camped in the Kilkenny half but the visitors held firm and their joy at the final whistle was understandable as the result sees them move a step closer winning a title they last held in 2001. Adding to their celebrations was the naming of Andy Kavanagh as the man of the match.